3) t=13.6 months = 13 months and 18 days. 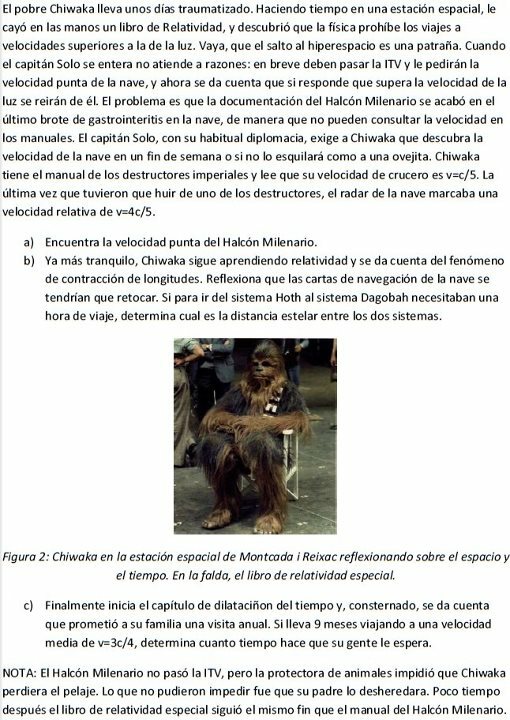 where u=Millenium Falcon velocity, v=imperial cruiser velocity= c/5, y V=relative speed=4c/5. Substituting the numerical values, we obtain the given solution easily. Problem 1. In the S-frame, 2 events are happening simultaneously at 3 lyrs of distance. In the S’-frame those events happen at 3.5 lyrs. Answer to the following questions: i) What is the relative speed between frames? ii) What is the temporal distance of events in the S’-frame? Problem 2. In S-frame 2 events occur at the same point separated by a temporal distance of 3yrs. In the S’-frame, is their spatial separation. Answer the next questions: i) What is the relative velocity between the two frames? ii) What is the spatial separation of events in the S’-frame? Therefore, the second event happens 1.8 lyrs to the “left” of the first event. It’s logical: the S’-frame is moving with relative speed for . Problem 3. Two events in the S-frame have the following coordinates in spacetime: , i.e., and , i.e., . The S’-frame moves with velocity v respect to the S-frame. a) What is the magnitude of v if we want that the events were simultaneous? b) At what tmes t’ do these events occur in the S’-frame? Problem 4. A spaceship is leaving Earth with . When it is away from our planet, Earth transmits a radio signal towards the spaceship. a) How long does the electromagnetic wave travel in the Earth-frame? b) How long does the electromagnetic wave travel in the space-ship frame? b) We have to perform a Lorentz transformation from to , with . Remarks: a) Note that and differ by 3 instead of . This is due to the fact we haven’t got a time interval elapsing at a certain location but we face with a time interval between two different and spatially separated events. b)The use of the complete Lorentz transformation (boost) mixing space and time is inevitable. Problem 5. Two charged particles A and B, with the same charge q, move parallel with . They are separated by a distance d. What is the electric force between them? The same result can be obtained using the power-force (or forpower) tetravector performing an inverse Lorentz transformation. Problem 6. Calculate the electric and magnetic field for a point particle passing some concrete point. Note that we have if .